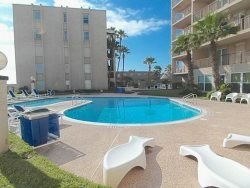 Lounge in Luxury at South Padre Island.. 3 Bedroom 3 Bath Sleeps 8. Two Pools and Direct Beach Access. Located at Beach House Condominiums. Speak to Jan and Cianna for details and personalized service. Let us help you make vacation planning a breeze. Browse photos and amenities for all our rentals and book online 24/7. Beachfront condo with spectacular views •A hot tub that sits next to two crystal clear swimming pools. Fully furnished condo with all the amenities of home including: A fully equipped kitchen, dishwasher, refrigerator. This open and airy 3 bedroom 3 bathroom condo lets you know you are on a beach vacation from the minute you open the door to the classic theme. The King Master , 2nd guest room has a laundry closet. The 2 guest bedrooms with 3 twin beds and a TV DVD . The views from the big balcony will make you want to stay forever. Note: Mini starter soap sets are provided... IMPORTANT It is important to note that this is a self catered and fully equipt kitchen and home, Please bring any items you want to make sure and have during your vacation. Larger Kitchen & bath soap, extra paper towel and tissues, paper plates, paper napkins solo cups etc. Make sure to bring electronic devices, music, and gaming, computers and video to TV cables are great and dvd movies.